Eversafe’s two car steel garage features two 8’x8’ all steel garage doors, a steel walkdoor, free delivery to your building site and free installation on your pad. They are easy to customize with drive-through setups available if your site allows for it and you can also add doors to the sidewalls of the garage. With a selection of 12 colors and the option of accent panels and two-tone wainscot it’s easy to match your home. You can use windows to dress your garage building up further while adding natural lighting and ventilation. Call us at 1-800-374-7106 for more information and pricing on the variety of accessories we offer. If the 22’x25’ standard double car garage is not the size that you need, Eversafe offer’s other sizes that will comfortably accommodate two vehicles. Economically add a roof-only lean-to for parking your vehicles and trailers out of the sun and rain or enclose the lean-to walls for secure storage. Eversafe offers hybrid models that combine a steel carport and an enclosed area. Our steel buildings in Florida are engineered to meet the hurricane wind loads and with additional frames in heavy snow areas. An Eversafe 2 car metal garage is the perfect addition to any home because it’s affordable, can be installed quickly and gives you a perfect place to store things while also providing protection for your vehicles. Throughout the country, Americans are reinvesting into their own homes and properties through expansion rather than moving. Part of the reason is because property costs are so high, and it makes more sense to upgrade your own residence than to buy something new. The property as a whole increases in value when you add a 2 car garage to it. However, you do not want to spend tens of thousands of dollars adding on to your building and have to wait months for it to be finished. A metal 2 car garage can be assembled quickly and is far less expensive to have installed than a building made of concrete or wood construction. Even better, these structures with metal frames can be designed to withstand hurricane-force winds and pass Florida and Texas hurricane building codes. You do not have to worry about them absorbing moisture, warping or cracking and termite damage. They are prefabricated so the installation time is very fast and included for free from Eversafe Buildings. The concrete foundation and slab design is included in your drawings on standard buildings to ensure that your slab and new steel building are a perfect fit. 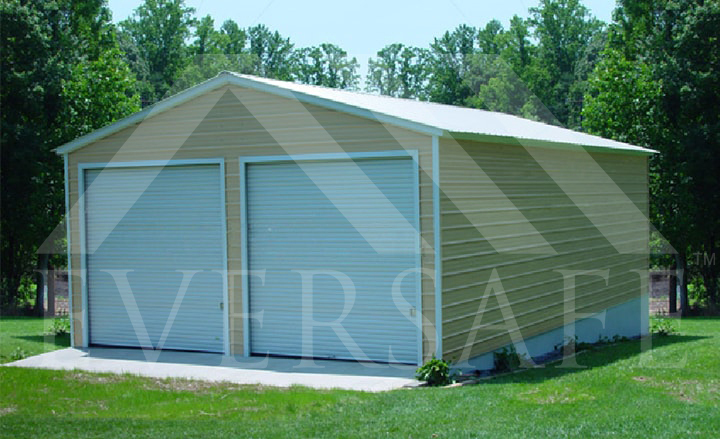 Eversafe Buildings provides great deals on 2 car metal garages and other models that are ideal for steel workshop buildings that will make a great addition to your home or business. The interior of our kits are easily accessorized with shelving, lights and more options that allow you to get more use out of the building for storage or as a workshop. Different insulation systems and methods are available for the ideal man cave to pursue your hobbies. If you are curious about cost, installation time or anything else, you can contact us today to receive a free quote and more information about these shop buildings.